Our small group each made 8x10 inch Self Portraits. 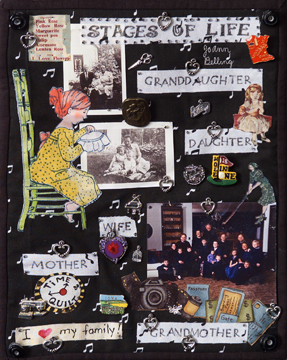 This was my endeavor showing the Stages of Life as a Granddaughter, Daughter, Wife, Mother and Grandmother. Photographs, learning to sew, reading, golfing with Hole-in-One, teacher, born in Minnesota, living in Iowa, sewing machine, Steinway grand, cruise, flying, camera for photography profession, hearts says it all. An interesting group project with a great variety presented tie tacked to a black quilted background.